A Worksop Town player has been fined and banned from the game for 84 days after an ‘assault’ on a match official. Michael Blythen, who joined the club this summer, was given the suspension after an incident after the full-time whistle when Tigers took on Handsworth Parramore on 22nd August. There was controversy during the game, Worksop players Matthew Thompson and Kyle Jordan earning red cards, before Blythen was sent off after the match. The former Dinnington Town and Hallam FC man was shown a red card for apparently protesting the officials’ decisions, including their refusal to award Worksop a stoppage time penalty in the 2-1 defeat. 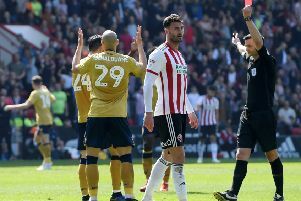 A statement from the Sheffield and Hallamshire County Football Association revealed the reason for Blythen’s lengthy ban. “In a match on 22nd August between Handsworth Parramore FC and Worksop Town FC in the Northern Counties East League, the County FA received reports from the officiating match officials regarding an incident that occurred. “Michael Blythen was subsequently charged with assault on a match official and placed under an interim suspension order. A Worksop Town spokesperson said: “Michael Blythen is currently suspended, serving an 84 day ban for misconduct following his actions at the end of the Handsworth Parramore game.